I love sea gulls. Our Bahamian variety of "Laughing Gulls" really have personality. They are just about as "Bahamian" as all of us. Can we learn life lessons from these mischievous, fun-loving birds? Absolutely. 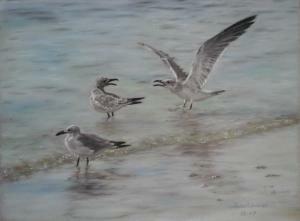 I learned a lot from this image that I captured and rendered as a pastel painting entitled "The Argument". A gull swoops in from the far right to pick a fight, and his opponent responds. But the little fellow in the foreground has the presence of mind to walk away with his beak shut. And so should we! The soft colours in this pastel hint to us that whatever maybe going on around us, we can still have peace; peace within ourselves and peace with others. A powerful lesson to learn from Laughing Gulls. It has been an endless summer this year, at least it feels that way. The slightly darker and slightly cooler mornings and evenings are indicating a shift in seasons. But somehow it seems the Bahamas and the entire Caribbean are relegated to only one season year round – summer. "Global warming"? We feel it. August was long and relentless, and we look forward to relief. Relief from the suffocating heat and humidity, and from the anxiety and anticipation of a new storm spawning every other day. Our neighbours in the Caribbean have not been as fortunate, and our hearts go out to them. Life will not be the same for a long time. For us, it is still “better in the Bahamas”, but for how long? We have been very fortunate. We should be grateful, thankful, and empathetic. We spent our August in Eleuthera, as we usually do. So wonderful to enjoy spending time with family, good food, great company, walking and swimming on stunning beaches … you almost forget the excrutiating heat. We ventured into historic Current, one of the oldest settlements in Eleuthera, on an errand to check the post and the mail boat. It is so sad to see the only food store closed, and the post office only open for an occasional hour through the week. Looking through the corner leading to the dock where the old Current Club used to be, I was struck by the contrast of a lone dark figure sitting on the dock against the backdrop of icy blue shallow water. I had to stop to capture the image. His relaxed pose was classic, almost abstract in a sense. But it expressed to me a relaxed kind of resignation … resignation to the way things are, the scorching heat of climate change, as though “you can do nothing about it, so why do anything” kind of attitude. The one we all have to adopt when monster storms decide to take their course. All you can do is brace for the worst and hope for the best. He looks exhausted while bearing the full brunt of the sun, just as we have all felt at some point during this seemingly endless summer. Yet he is still looking at us defiantly out of the corner of his eye, and asking 'why'? I've always enjoyed writing, maybe even more than painting. Then why haven't I done much of it? I don't know. Life catches up with you. Writing is a pause in the routine where you can reflect a bit and try to make sense of it all. I've been trying to connect everything we do here in Abaco. You have to do so many different things living on the island to survive. That's just the way it is. But I feel that everything we do is interconnected, and the common thread that ties everything together is our art. 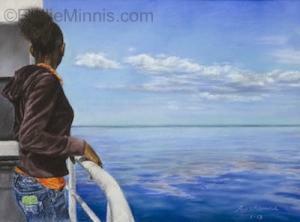 I've launched a little website about the “Art Side of Abaco” that I am calling www.RoshanneEyma.com for the moment. It encorporates the Eyma (married) side of my life that is in addition to just the visual art Ritchie and I produce. It includes our real estate practice and language arts. 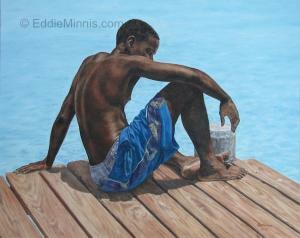 Bahamian scenes and images make the walls of a home live and embrace the environment. Art speaks volumes, and so do words in any language. Language is also an art. From the grace and efficiency of sign language, to the down to earth expressions of Haitian Creole, that is also a part of me. And it all fits together. So this is the beginning of a journey. A journey where we will enjoy the scenery along the way, without worrying too much about the destination. I will share with you some of my experiences living on the island of Abaco in the Bahamas, some of my latest paintings, and some of the fabulous vistas and villas we see along the way.